1. Traffic. I couldn't drive. My blood pressure thanked me. 2. Detentions. In my entire school life I only had one detention. Now I have about five a week. Why do I get punished when my behaviour was always good? 3. Word. I'm sure Word was not so bloody annoying 15 years ago. I'm sure it was easier to make a table and not end up crying with frustration as it refused to moved where you wanted it to go. 4. Getting to 127 blog posts every year. Blogging was easy; I was a student; I had shedloads of time. 5. That current scary bug that is stalking the Internet. Mr Z told me on Friday not to make any purchases online for a while. I made three online purchases within the next 12 hours before I remembered that I wasn't meant to. Then I got too scared to check my balance online to see if I'd been hacked, in case I got hacked checking my balance. 6. Having two names. Most people now have my married name but the odd one in my maiden name pops up now and then. Why do people always want my marriage certificate? It's awkward to photocopy. Why won't my passport do? 7. Telemarketers. I didn't have any money; nobody ever rang me. 8. The crappy plastic roof over the porch falling down. I didn't own a home. The fabric of the building in which I lived was not my concern. I definitely did not look at it critically every couple of days and worry about getting damp in the walls. 9. Feeding the cat while we're away. No cat = no problems. 10. Ofsted, my pension, my appraisal, performance related pay that is not linked to my own performance, work-life balance...though, to be fair, when I applied for teacher training I didn't expect to make a career of it and now I can't see myself doing much else. * I went with 15 years because 10 years ago was not exceptionally different to now. I don't know if that is depressing or a good sign. Mods: None to speak of, although I don't feel too keen on the idea of using the rest of the ball to make a ginormous pom pom for it. It feels a bit of a waste. It's really very reflective, which I like a lot. I promptly went online and ordered a bunch of other colours so I can do most of the boys' hats in it. This one took about an hour. I'll be motoring through them at this rate. Mods: None required. This is a great little pattern and I especially like that it is worked top down because it makes for such a neat bottom edge. I knitted one as part of the first hat project (the last seven rows of which were in this very skein of yarn as my previous skein ran out) and I had forgotten how good it is. It only took me the length of a film. Two of my girls requested a burgundy hat; this yarn is a bit more purple than I would normally expect burgundy to be, so this one is for the girl who isn't a red-head. She'll get probably the same hat knitted in a browner incarnation. I'm toying with the idea of breaking out my Vogue Lace Stitchionary and coming up with my own version of a lacy chunky hat, but time may well put pay to that idea. Rocking the 8th wedding anniversary present Chanel sunglasses in the back garden. They deserve a Fave Friday post all to themselves. I was too busy this Friday though, mistiming a squash shot and hitting Tutt on the elbow hard enough to require a trip to Minor Injuries. Not my finest hour. This is a genius idea. Make a lemon drizzle, but instead of just drizzling it with lemon, add some gin in there too. A lemon ginzle, if you will. I've run out of tonic (this is a disgrace) so mine is just gin and lemon; I used the slightly unusual Spanish gin Mother Hand brought me back from one of her holidays in the cake, and Gordon's Elderflower Gin for the ginzle. It was that or Sipsmith and I couldn't bear to use that for baking. It's quite potent. I'm not really sure whether I should be taking it to work, to be honest, but I'm sure the staff will thank me for it. The ingredients thing is a bit odd. I did rummage around the internet looking for an alternative because who has ever heard of weighing your ingredients to equal the mass of the eggs? In the end, though, I decided it was pretty arrogant not to give it a whirl and it works beautifully. My four eggs handily weighed 250g so it was quite straightforward, especially with the butter. Weigh the eggs. Measure out that amount of butter and sugar; beat until pale and fluffy. Beat in the eggs. Fold in that weight of flour and baking powder. Grate in the rind of the lemons and fold this in too. Add the juice of one lemon and about half the gin. This will look pretty dodgy, especially to begin with, because it's a lot of liquid, but it's ok. Turn into a prepared loaf tin and bake for 45 minutes at 180 degrees until a skewer comes out clean. Meanwhile combine the remaining gin with the juice of the other lemon and the sugar (you'll see the original uses granulated but I only had caster). When the cake comes out, leave to cool briefly, then skewer all over and pour over most of the ginzle. Leave to cool in the tin. If you don't use lazy silicone bakeware like me, you might want to turn it out, remove the paper and put it back in the tin to ensure it (a) doesn't stick and (b) doesn't dissolve your lining paper into the cake. When completely cool, turn out onto a serving plate and spoon over the rest of the ginzle. I think I might try this with limes next time. This one took me a week because I am so busy. Also, I made a mistake on a cable row when I split a stitch where I had knitted with old ball and new ball together, so I had to tink back which put me off touching it for a few days. 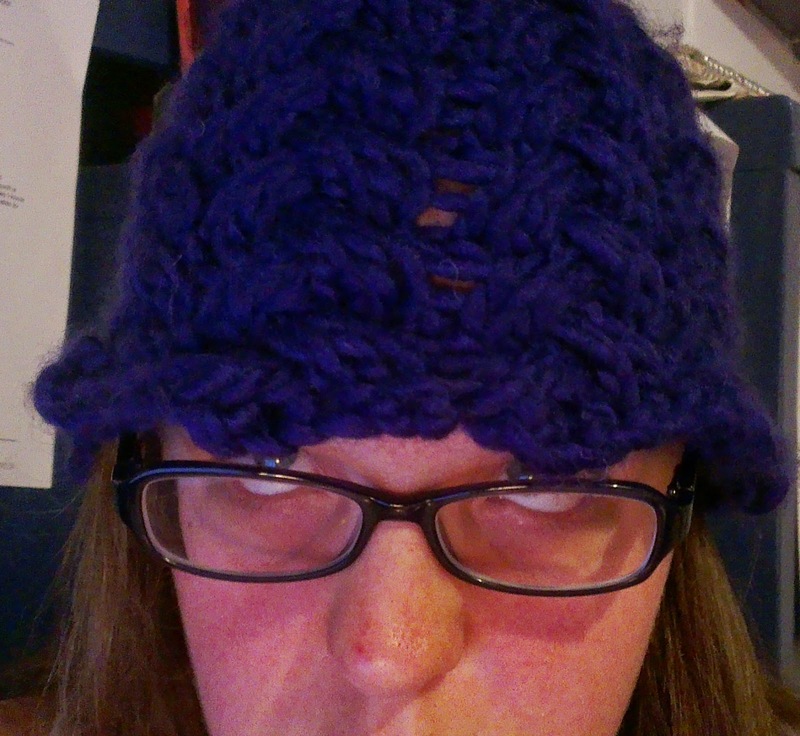 It is all the same as the first hat, but I did it on a 10mm needle so it is an easier fit. It used the leftover ball from the first one, another whole ball, and about 3m of another one. Gah! The picture's quite dark but, hey, you know what it looks like by now I think. Not this weekend, I hasten to add. I made these whilst it was still the summer holidays; how else could I squeeze in all the rolling, chilling and turning? I do enjoy something about the process of making this type of pastry. Part of it is being convinced the whole time that it isn't going to work and then it does. This dough did not rise as I expected it to, so I was convinced I was going to have some weird texture going on. While it probably could have been better - my butter was too soft and my timing was not very good - I don't think it was a bad effort for my first try. I used the recipe from Paul Hollywood's book, the blue one. On the left are pecan and maple Danish. I made a frangipane using pecan nuts instead of almonds. I don't think I really knew what a frangipane was: it was a lot more like a cake than I expected. 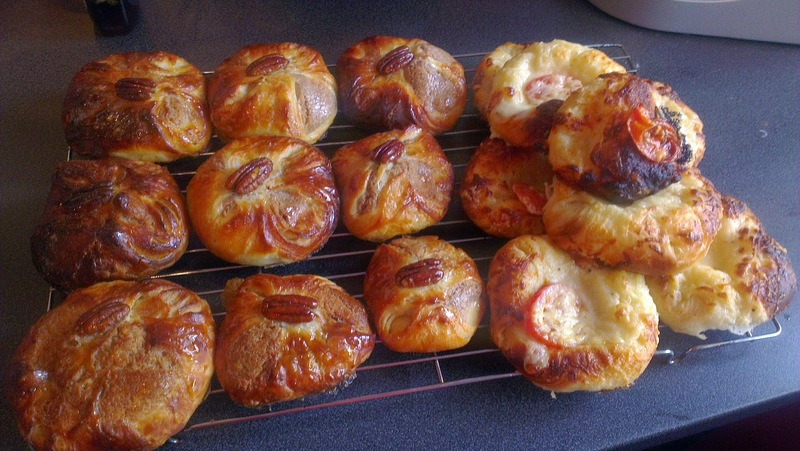 I glazed these with maple syrup; overall the effect was not overly sweet (good) and not overly pecan-ish (not so good). On the right are a cheese and tomato effort. I made a very thick, very cheesy white sauce, added a slice of tomato and grated a little more cheese over the top. Although they look messy and the tomato fell off of some of them during baking, I think these were more successful. I was worried the cheese sauce would become thin when it got hot and run off the pastry, but that didn't happen. I think these would be really good with an almond frangipane and a wedge of pink grapefruit, like those little tea cakes I made earlier in the year. I expect I will have another go although, tbh, the croissants I've made a couple of times now came out nicer. However, I have never yet attempted a creme patisserie so I should make a plan for some using that. I gave up wearing a watch when I left uni and went to the US. I reasoned that, as I wasn't working, I didn't need to know the time. Then I found myself struggling to wear one because it felt weird on my wrist. However, recently I found myself hankering after something in rose gold. I considered requesting it for an anniversary gift, but plumped for something else in the end. 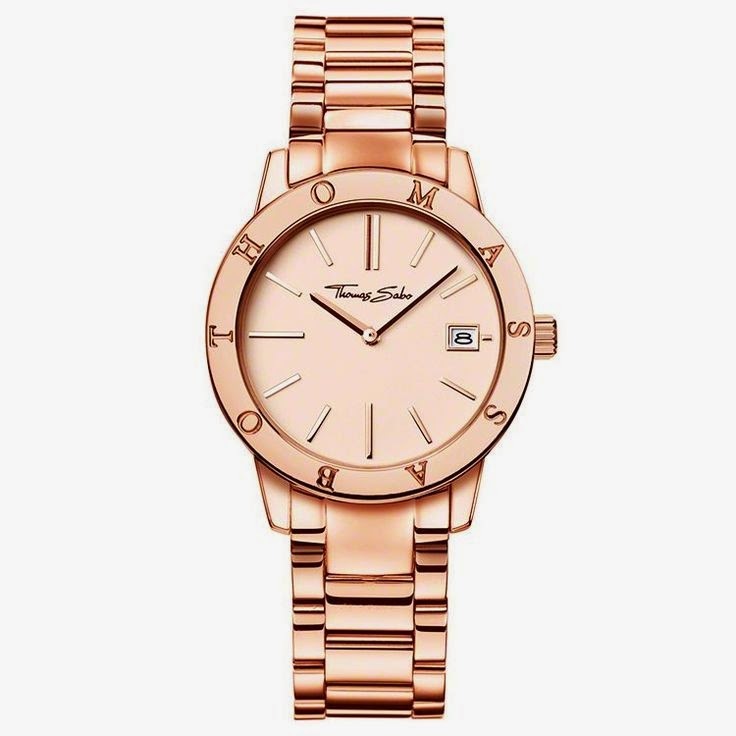 Then one of the people I went on holiday with had a lovely Fossil rose gold watch, so when I was in town last month I went to see what they had in this colour. The answer was, something dripping in crystals, or something only sized for children or, as the SA told me, Asian people. Meanwhile, in Thomas Sabo, the watch I had previously lusted after had disappeared from the window, so I went in to see if it was regular stock and the SA helped me try it on. When I made a slightly awkward comment about having big wrists, she even had the grace to say this was not true. The watch fit beautifully. I sighed, and told her, "Maybe next month." My resolve lasted three and a half hours. It is my "Well done on becoming a Head of Department" present to myself. I'm doing a good job of getting used to wearing it, when I remember to put it on. In spite of a very busy work weekend (there is no end in site to the exam board work), I did manage to squeeze in a few rows of the second hat. It's the same pattern as the last one, same yarn (definitely blue and not purple, right?) but on 10mm needles instead of 9mm. I might have to rip the other one back if it's a much better fit on these needles. I really should have finished it by now. Damn work. Am I nearly retirement age? I have been eating lunch like this since last January. I saw it online, somewhere. You put the dressing in the bottom of the jar and then layer up all the good stuff, so when it is turned out the dressing is on top and the leaves aren't soggy. Some people leave enough room in their jars to shake the dressing through, it seems, but that's just crazy - why leave shaking room when there can be more veggies? 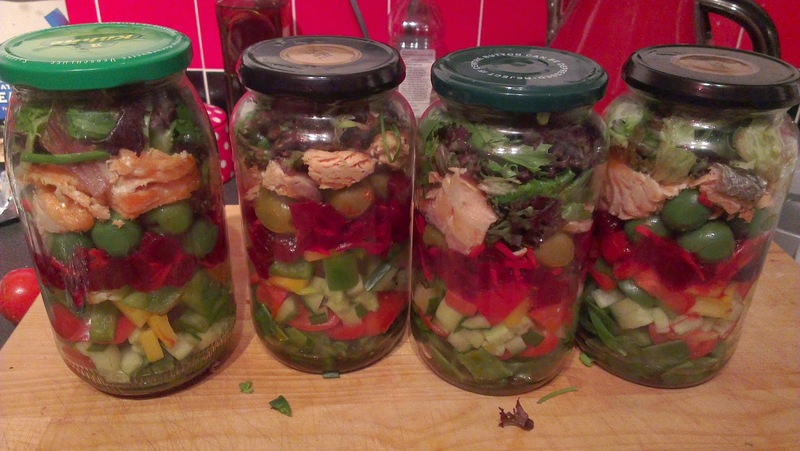 Mr Z chops everything for me on a Sunday so I can make them up daily, but since I acquired two more jars I make up four on Sunday and they are good for nearly the whole week. Everything stays fresh and crunchy. And when I turn it out on the plate at work, everyone marvels at my amazing salad - when it only takes about two minutes to do (as long as you have a partner who likes chopping things, anyway). Yakob celebrated his 20th wedding anniversary yesterday, with a tea party and a magician and a 20 year quiz, which he had helpfully labelled "10th anniversary quiz". Classic Yakob. I said I would bake a cake which meant only one thing - a classic coffee and walnut. We have a thing about "Coffee and Pedantic Walnut Cake" which came from a joke on Twitter that neither of us can remember. Then I got my recipe books out to get started and realised that, in-jokes aside, I have never actually made a classic coffee and walnut sponge before; at least, I can';t remember ever doing so. Coffee and Brazil nut, yes; coffee with chocolate coffee ganache, yes; but this was to be baked instead of a cake his wife was baking and I was worried about presenting something other than the traditional, with the buttercream and the walnut decoration. Thus, I read this article and produced something traditional. I am a bit worried about my oven because it keeps producing cakes that are very thin on one edge and very thick on the other, particularly if they're baked on the top shelf; the oven is not set on a slant, I am sure, or it would be obvious when pouring oil into a pan on the hob. I fear that the fan is blowing a bit heftily and causing cake-batter-drift. Since the oven is approaching its 10th birthday, perhaps it needs a good seeing-to by an engineer. Toast the walnut halves in a dry pan. Don't forget about them and keep thinking, "What is that smell?" Set aside enough for decoration and then chop up the rest. Heat the oven to 180C and prepare 2 x 20cm sandwich tins. I prepared for this by buying silicone bakeware. Perhaps I should try baking in a real tin again and seeing if this solves the batter-drift problem. Beat the butter and sugar together until really light and fluffy. Pour in the beaten egg very gradually with the mixer running, scraping down the sides of the mixer as necessary. Fold in the flour, baking powder and salt, adding the coffee and chopped walnuts as you go. This should be a soft-drop sort of batter so add some milk if you need to. I probably added about 4tbsp of milk. Divide between the 2 tins, and bake for about 25 minutes until well risen. Allow to cool for 10 minutes in the tins, then put on a wire rack to cool completely. For the icing, beat the butter until soft and fluffy, then beat in the icing sugar, marvelling as you do at how icing sugar can just get itself over EVERYTHING, even when there is a lid on the mixer. Beat in the rest of the icing ingredients. Continue beating, hoping to get rid of that slightly grainy texture, and wonder why you can never manage it. Think fondly about Swiss meringue buttercream and realise it is too late to go down that road now. Realise icing now very soft and starting to look a bit on-the-turn; place in fridge until cakes are cold. Assemble the cake with half the buttercream in the middle and the other half on top, decorated with walnuts. You may need more walnuts if you have eaten some of your toasted walnuts as a baking snack. The coffee flavour was a bit too pronounced for me but it got the big thumbs up from everyone at the party. Unfortunately this meant I didn't get a picture, but you've seen a lot of coffee and walnut cakes in your time, I'm sure. In 2008 my old tutor group were approaching the end of their compulsory schooling. They'd joined the school a year after me and I'd been their tutor all the way through. When one of them jokingly suggested I knit them all hats for their last Christmas, I thought that sounded like a good idea. I was a much slower knitter then but I managed it, even though the very sullen girl who had been moved to my group at the start of Y11 and never came to tutor time decided to come in on that last day of term and I didn't have a hat for her. I knitted her one with a skull on it and posted it home to her over the holidays. It would have been too small, but she never said anything. Now it's 2014 and my new batch are almost there. I feel very old. I loved my old tutor group to bits but they were extremely hard work; in contrast this one is very easy and pleasant. 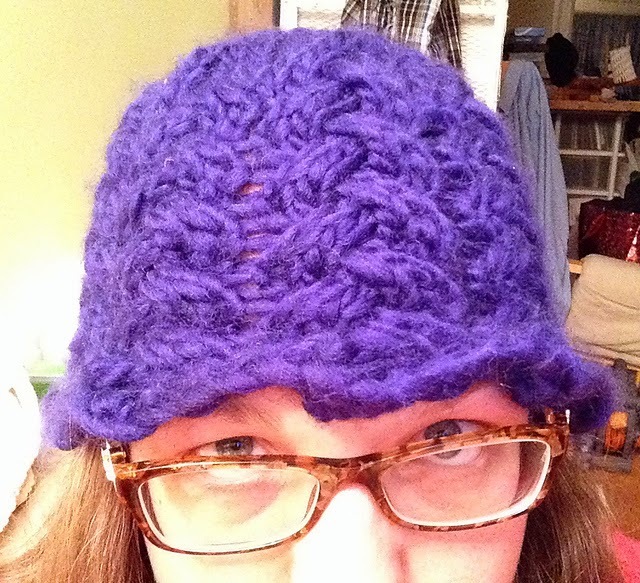 Thus, I thought I had better continue to hat tradition and this is the first one - the Suzi. Yarn: Sirdar Big Softie, about a ball and a half...the shade is Blinging Blue, which I maintain is a royal blue but which Mr Z claims is purple. Mods: Using the 9mm needle. 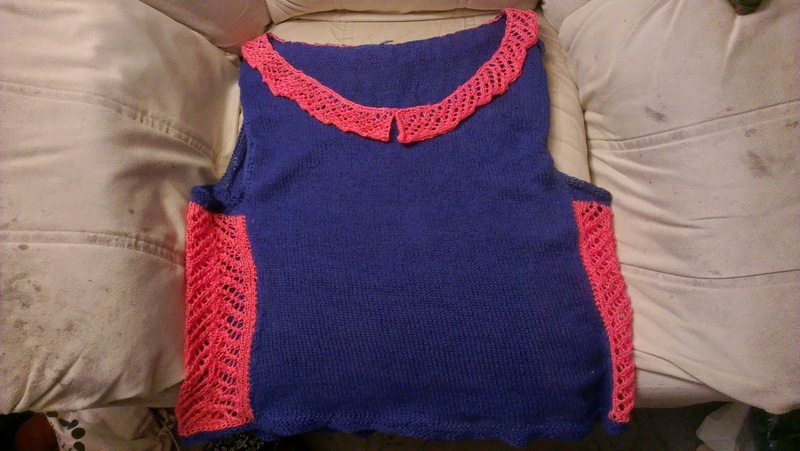 It was snug on me; better after a good blocking but I should go for the 10mm for the next one. It is not blocked in this (terrible) picture. Most of them have requested beanies; I hope this is the sort of thing they mean. It is a nice pattern: the cabling keeps the interest up. I am also hoping to knit most of them out of Softie. I completed this one in the space of three episodes of Game of Thrones, about three weeks ago now. No knitting has taken place this week; the combo of doing the exam board work and being a head of department has put pay to that. Now I need to find, as recommended to me by someone (Jenny? ), a small child who loves making pom poms. They all want pom poms, of course. Sigh. In case you were unaware, I love this colour. 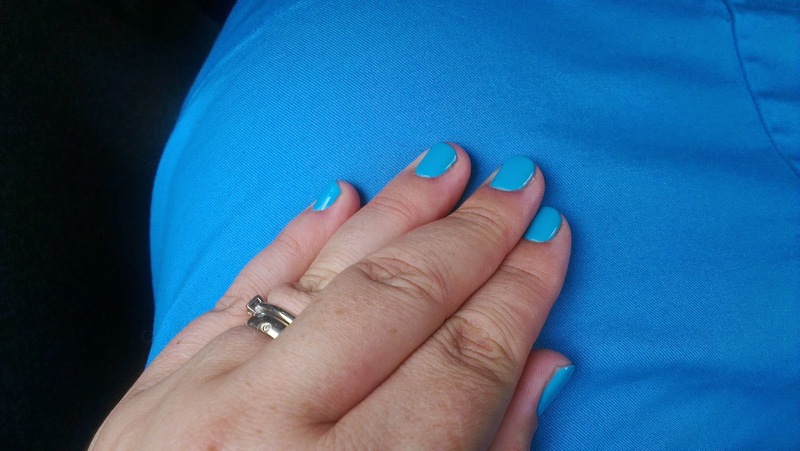 I was excited to discover it is as available as Shellac (Cerulean Seas) and even more excited to discover that it perfectly matched my skirt. It also, as was pointed out to me by no less than three sales assistants on the day I took this picture, matches the trim on my bag. It's good when you have a favourite colour because everybody assumes you're just co-ordinated. Sadly I had to remove the colour on Wednesday ready for a manicure yesterday, when I intended to have a more traditional colour (while nail varnish is not banned for staff, I did wince this week when providing nail removal wipes for two students whilst at the same time having such an obvious paint job myself), but then I missed the appointment. I had a shocker of a day. First, thanks to a variety of reasons my role on the new exciting writing project was moved to being digital resources only, which made me feel very sad (not really anything I did/failed to do; and certainly not the only writing project in the works, so not the end of the world), but then I got stuck in traffic for 45 minutes because of a BROKEN DOWN CAR (push it onto the pavement, you git!) and missed the appointment, and was unable to rebook because they're so busy. Which means that, tomorrow, inferior nail technician will do an inferior job. I might have to have this colour again to cheer myself up. I do get cheerful just looking at it. Bit of a cheat, this one - I only managed to put a few rounds on it. I have been very busy all week, dealing with exam board work (what schools would call re-marks but that's a bit of a misnomer because the initial marking is scrutinised, rather than the paper being re-marked....how dull of me to tell you this but every time I have to call the process "re-marks", so people understand why I am so busy, I wince internally because it's not really true. I clearly have issues) and being a head of department. I got three boxes of chocolates in my first week; if this is what being a HoD is like then I really should have done it years ago. I also had a very interesting workshop with the publisher on Saturday. It meant spending a weekend in London that I could have done with having at home; but I got to hang out with my old friend Sian and the workshop was great, although scary, because there is a lot of work ahead. Expect blog blackout for about six months next year, by the looks of it. Either that or many lists about why I love my job, which is a sure sign things are overwhelming me. I digress. 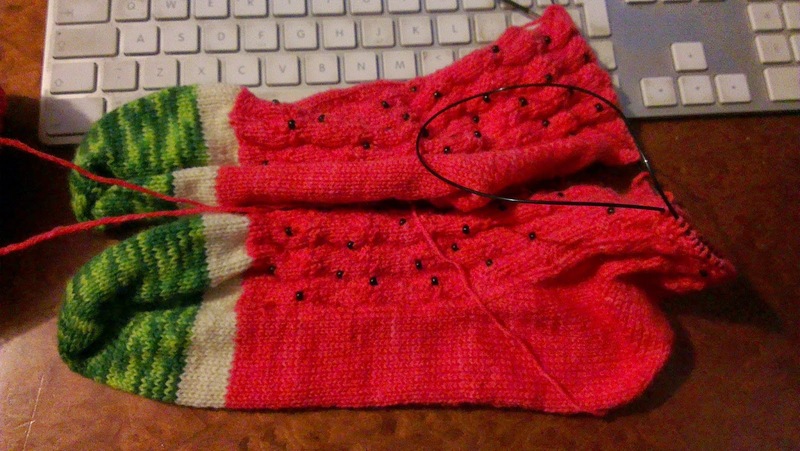 Of course I started these socks months and months ago, and I had super-high hopes for finishing them by Easter, and then I left them on the ski trip bus and they took nearly eight weeks to get back to me, and since then I have been working on summer tops. But they're finally having a bit of attention. I am hoping to maybe finish them by the end of the month, because, how pretty? I want to wear them! They're even cuter in daylight. Mods: I knitted shaping in the body pieces. 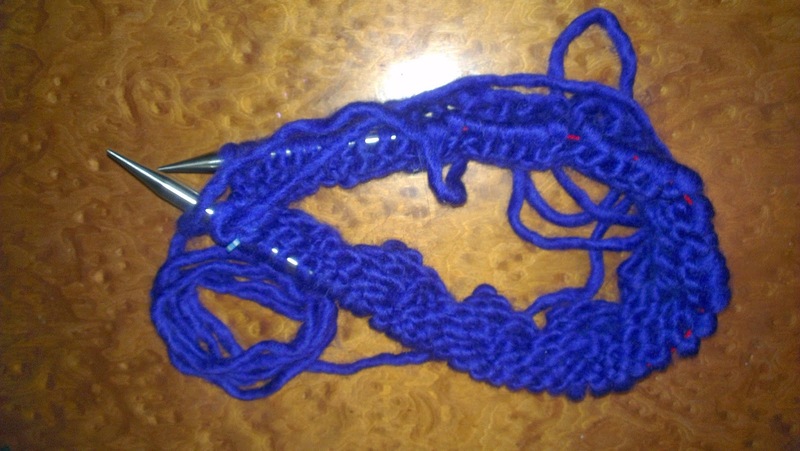 I knitted a hybrid of the two largest sizes to better fit my shape. Due to my apparent inability to read a chart, I knitted a slightly different lace pattern for the collar. I also slipped the first stitch on each row so when it came to crocheting it in place....well, let's just say there may be a little bit too much collar for the neckline. It needs a good blocking and the colours look a bit weird in this hasty picture; I don't know if anybody else would pick this combination but I really like, ergo it is a success. It's much too late in the season to wear in the sunny weather, but I think it will look nice over a long sleeved white t-shirt now the weather is cooler. I do love the pattern. This was a great issue for me and there are a good half dozen patterns in it that are in my mental queue; but this was the stand out pattern for me. I'm a sucker for a Peter Pan collar.